The president, right, announced Aguirre’s resignation today. Opposition senators have welcomed today’s resignation of Department of Justice (DOJ) Secretary Vitaliano Aguirre II. “It proves one constant in a Cabinet appointment. One minute you are the lord in your little kingdom, the next minute, you are clearing your desk,” Senator Grace Poe said. Senator Risa Hontiveros said Aguirre stepping down was a “clear victory against injustice and impunity”. However, she added that Aguirre had caused great damage to the DOJ, turning it into a “purveyor of fake news” and “refuge” for criminals. 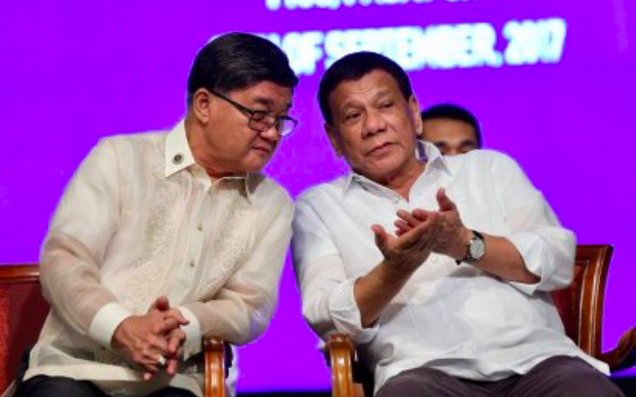 “Mr Aguirre turned the justice department into a leading purveyor of fake news, a manufacturer of fake legal cases to harass the opposition and a refuge for drug lords, plunderers and other high-profile criminals,” she said. The 71-year-old former trial lawyer and Duterte were both members of the Lex Taleonis Fraternity at San Beda College law school. Aguirre’s position has been looking increasingly shaky for several months. He recently came under fire for the DOJ’s decision to dismiss charges against high-profile drug suspects Kerwin Espinosa and Peter Lim, along with 20 others. The president was said to be enraged by the decision, and even threatened to put Aguirre behind bars if the drug suspects were released unpunished. Another public outcry followed Aguirre’s decision to place alleged ‘pork barrel scam’ mastermind Janet Lim-Napoles under the Witness Protection of Program. He was also facing a complaint before the Office of the Ombudsman over allegations that he abetted the proliferation of fake news in government. Last year, for example, he falsely claimed that several opposition lawmakers held a clandestine meeting in Marawi just weeks before jihadi fighters took hold of the city. He also claimed that a Korean mafia was behind the killing of South Korean businessman Jee Ick Joo in October 2016. Furthermore, he was implicated in a 50 million peso bribery scandal in November 2016 involving Bureau of Immigration officials and gaming tycoon Jack Lam. The president has now named Senior Deputy Executive Secretary Menardo Guevarra as acting justice secretary. Guevarra went from working as an economist at the Bangko Sentral ng Pilipinas to founding his own law partnership in 1990. Until April 2015, Guevarra was in private law practice and also served as faculty member of the Ateneo Law School. His work in government has included being a member of the 2010 Philippine Truth Commission, Deputy Executive Secretary for legal affairs at the Office of the President and Commissioner of the Philippine Competition Commission.